The most accurate assassin in all of Gotham joins the MAF EX lineup from Medicom! 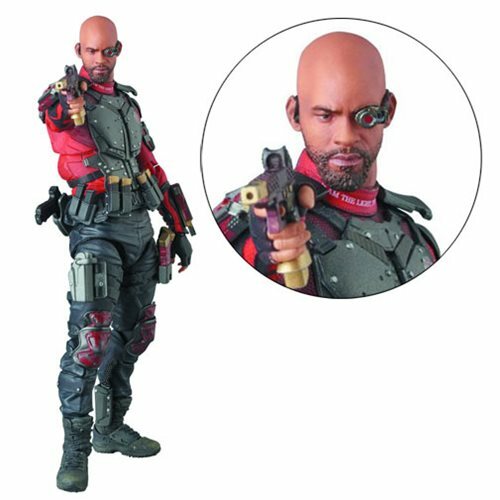 Standing just over 6-inches tall, this Suicide Squad Deadshot Miracle Action Figure EX Action Figure - Previews Exclusive features the likeness of actor Will Smith and comes fully armed. This highly detailed action figure features multiple points of articulation, interchangeable hands and heads, and an arsenal of weapons. Assemble your own team of misfits with this Suicide Squad Deadshot MAF EX Action Figure - Previews Exclusive. Comes packaged in a window display. Ages 15 and up. Justice League Superman SH Figuarts Figure P-Bandai Ex.